Mahuta Rd is a comfortable, informal, open plan Lockwood holiday home with great views across the lake offering the most fantastic sunsets in Five Mile Bay Taupo. The house has five roomy bedrooms each with either double or Queen size beds. One bedroom also has a single bed. The beach is a great safe swimming beach 200 metres from the house. There is excellent fly fishing at the mouth of the Waitahanui River 1 km away. The harling is excellent from 5 Mile Bay itself. There is plenty of room in the front of the house for parking boats and cars. There is a private section out the back. Taupo township is 8 mins away by car and there is a local store at Rainbow Point halfway between 5 Mile Bay and town. For the energetic it is possible to walk or bike along the lakefront into town. Minimum stay 2 nights. Please take all rubbish with you when you leave. POA for Lake Taupo cycle weekend. Beautiful spot a short walk from the lake away from the crowds. Great location and outlook, nice comfortable stay. Nice and roomy. Close to the Lake with some lake views from the house. 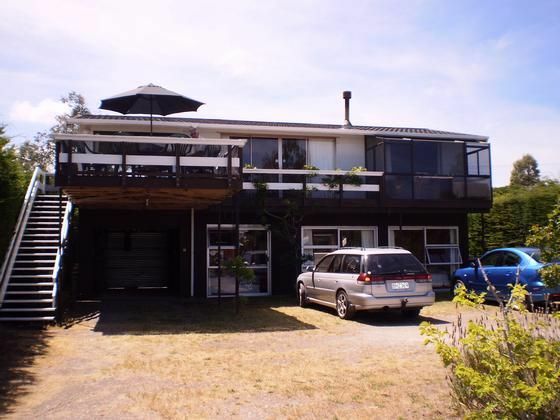 Great views and great location in terms of proximity to the lake and to Taupo.